Ty got a little tiny push cart for Christmas. It's about the right size for a one year old to push a few blocks or stuffed animals in. Ash and Briggs thought they would modify it for their own play. Ashlynn was sitting in the little cart while Briggs was loudly pushing her around and around the house. I thought this wasn't such a good idea so I gently told them, "Let's not do that. That cart is not meant to carry a 6 year old." Without even communicating Ashlynn got up and Briggs walked around and sat in the cart, the two of them preparing to continue their play with roles reversed. I had to then state the obvious that the cart was not meant to push 4 year olds, either. I love how their minds work! I just thought I'd share a little clip from Our weekend at Brian's Parents. Ash, Briggs and Cousing Caleb went swimming and put on a little show for the camera. This is a good representation of Ashlynn's real personality, complete with the "Rock on!" hand sign at the end. This is the stuff blogs are made of. I don't even know where to start. Basically Ashlynn and her best friends little brother, Harry decided to get married. This decision was made in order for Maggie and Ashlynn to be "related" and so their kids could be cousins. They kept talking about this marriage that was going to take place until one night all of the parents went out to dinner and left the kids with the sitter. When we came back, there were pictures to document the incident. You need to understand that when Harry and Ashlynn do anything, they don't do it halfway. It really would be a scary thing if they got married. There were not just the obvious costumes (complete with top hat and sword) but Briggs walked Ashlynn down the aisle, They exchanged rings that came from genuine ring boxes and they finished it off with a bang by sealing the deal with a kiss. And not just any kiss. We are talking bear-hug-on-the-lips-kiss. When I asked Ashlynn if she knew that she was not supposed to kiss boys until she was older, she just looked at me with total honesty and answered, "No." After a few days, Harry and Ashlynn's play got a little carried away and we had to tell them to stop. Harry got down right mad when we took his wife home that night. Much to his dismay, his mom told him he wasn't allowed to sit with his wife at church until he was 18. Ashlynn asked the Primary secretary if she could hold her baby because her and Harry had gotten married. I don't have pictures in my posession of the nuptuals, but if you click on Harry's familys' blog link you MUST view the pictures. Ashlynn declared yesterday that she thought Ty was going to be a mad scientist when he grows up. I think that is very appropriate. 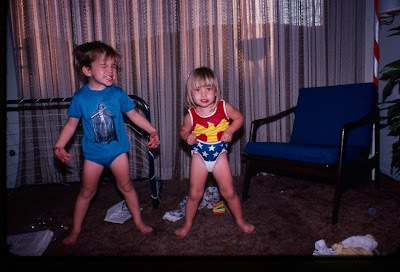 To kick start my blogging career again, I thought I would post a picture of Brian with his sister, Lisa, showing off their "super" new underwear.